Jun Shan Yin Zhen White Tea is a rare tea consists of only singular tender buds picked in Spring before they open. Jun Shan Yin Zhen White Tea has been honored as the king of Yellow teas and one of Chinas Ten Famous Tea. The reason for the name, White Down Silver Needles, is quite apparent with one glance at the buds. 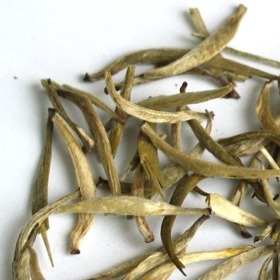 The prominence of the delicate white hairs on Jun Shan Yin Zhen White Tea buds is quite striking. Jun Shan Yin Zhen White Tea comes from Mount Jun, Hunan Province. Light honey-sweet scent. Its taste is delicate with a clean mellow sweetness. The aftertaste is fresh. Over-infuse the tea, would give a bitter taste. Jun Shan Yin Zhen consist of thick, needle-shape tea buds. Good Yin Zhen leaves looks like a knife. Tea brewed from these buds have a pale yellow hue. Very smooth, light, and crisp, a great cup. Unfortunately its not the Jun Shan Yin Zhen "king of yellow teas" that won the top 10 competition, but it is one of the best white teas Ive had - a more lively silver needle. It has a nice aroma with a vegetal undercurrent. Definitely a keeper, but it wasnt quite what I was hoping for. this is a delicious tea, and beautiful to the sight. it is very sweet, floral, almost frutty. if over brewed it gets bitter. A very great tea, one of the better white tea. The leaves are perfect. The brew is very smooth on the palate. The aroma is sweet, the taste refreshing. Wonderful. The posted description is right: when you drink this hot, it makes a nice, warm, satisfied feeling in your chest. The leaves can be steeped multiple times, but oversteeping ruins the flavor. This is my second white tea I tasted and it is great one in my opinion. Better than Pai Mu Tan. Very light taste, visually great and the colour of tea is beautiful, remind me on skin of green grapefruit. Definitely recommended for everyone. Classic Silver Needle. The more I drink white tea, the more appreciation for its smooth almost creamy texture I gain. The only other silver needle Ive tried has been from Rishi Tea, and it compares very nicely. Really nice white tea, light, subtle and fresh. I can drink gallons of the stuff! This is a very smooth, mild yet flavorful tea. Just good flavor too, no fruity stuff. Always a favourite, nice taste and sweet aroma. Long name tea, my favourite. Very warming on a cold morning and nice aroma. This is a delicious tea, it has a good yet mild flavour and aroma. This is a good tea, very good yet mild taste, and nice aroma. Always a favourite, best drank with a good friend and easy music.